Modern antique style blind-stamped calf binding. 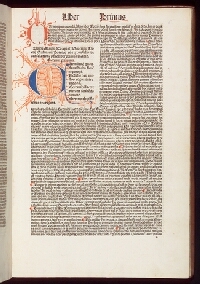 71 leaves (of 74), wanting three blank folios 1, 73, and 74; elaborately rubricated initial capital on a1r, initial capitals filled in blue and red, sometimes tails extending to the margin; paragraph marks in red; some annotations of nota mark. 1. Johann Conrad Feuerlein, Nürnberg. 2. Arthur Gordon Rippey, Denver.